I have since brought many of my family members and my fellow West Africans to The New Millennium Training Center for their certificate training. The school really helps you with the necessary preparation for the state board exam with actual skills checklists and practice written exams with all of the answers on the back, for the state board. No wonder we all graduate and come to The New Millennium for success and job carrers. We Look the Look, we Talk the Talk and we Walk the Walk....just like Mr. Art taught us to do..Thank you. Both my sister and I have rained at The New Millennium Training Center and have gotten positions at the Staten Island Unicversity Hospital. I have to be honest, the administrator told me exactly what to expect and 4 wqeeks later, I was finished and took my NYS Board Exam right in the classroom, passed and used the school's free interview training classes to land a job almost immediately. Caan't do better than that !! By Father is a retired NYPD detective and he was satisfied after checking this school out and as a matter of fact became friends with the School Director Mr. Art. I found the instructorMS Kelly to vbe one of the best teachers I ever had. She made the MA class fun and I felt very comfortable taking and passing my National Competency Exam, all because of Ms Kelly and the other students because we broke intoo small groups and studied together. To me,this was like going to a mini college and as a FUll Medical Assistant I'm working and my father is always boasting about me and this school. Thanks for setting me up in a profession. The school is in a great spot for med assist with Dr offices all around you. 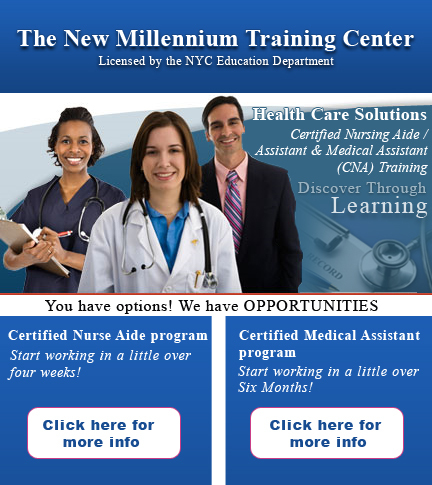 I took the Certified Nursing Assistant class at The Millennium Training Center and I honestly thought that it was the best class with the best RN instructor. I aced my state board exam because they gave us all of the practice tests with the Q & As. You can't ask for a better deal and my new job at Clove Lakes Nursing Home puts me in the 40K club with 1199 benefits. Thank you all at Millennium. My program gave me an opportunity to become independent with enough money to geet my own aprtment and move out of my house. Now I go to my medical office and look forward to being part of the professional team and I owe it all to taking my classes at The New Millennium Training Center. You can't get a better school and all of the doctors know them because they been around for so long too. Thank you for all of the good advice on how to properly prepare for a job interview. If it weren't for this schoopl, my nursing home never would've hired me. They told me how to look and what to bring with me and what to say that made the differece. Iwould recommend this school to my friends. I have a license to work anywhere I go and that's som ething in my book. Thank you again New Millennium and staff. I was a medical technician back in my country but when I came to the US I couldn't use my credentials so I was going to enroll into a college. 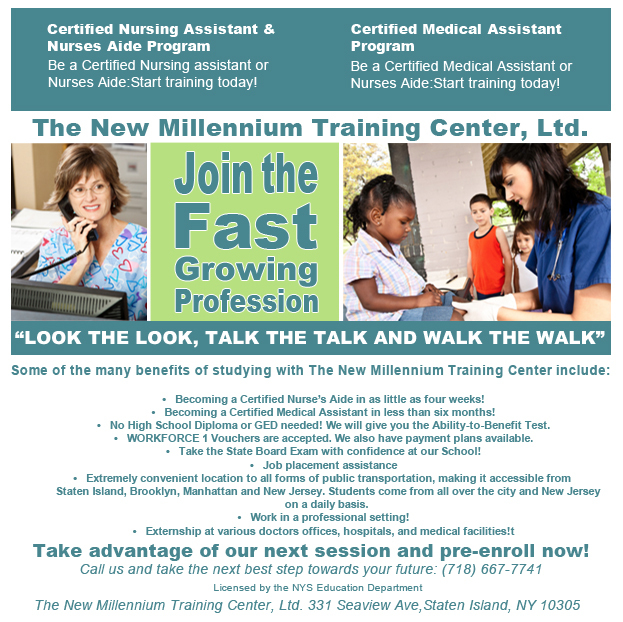 The New Millennium Training Center in Staten Island offered a CNA class that was only 4 weeks in length and I just finished and took my NYS Board Exam and passed. People coming out of college aren't going to make $17.50/hr like I'm going to start at in July. I'm not saying forget college, but why not make around 45K/yr while you're going to school also. Thanks to The New Millennium and their wonderful staff. 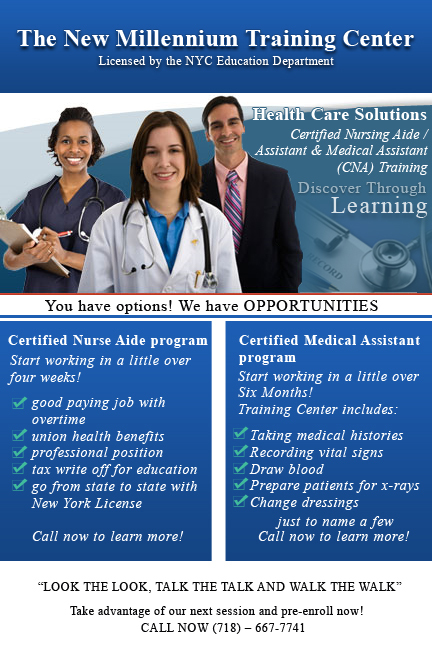 I was thoroughly pleased with the information and training that I received while taking the Medical Assistant program. When I went looking for a job, I was hired immediately because the Doctor's office was familiar with Mr. Art and the caliber of training that you recieve at The New Millennium Training Center. This is one of those real schools where you get your money's worth. Being a Medical Assistant has made me feel like a true part of the healthcare industry. I'm qualified to actually perform phlebotomy & ecg's and I know about office procedures like billing and proper record management. My MD's office likes me and I believe I have a future here with a respectable yearly income and career ladder. My instructor was the very best you could ever have. The New Millennium Training Center is a great school.Mr.Art & Michelle are wonderful and kindhearted.Marie(the instructor) taught me all I needed to know to become a CNA ,she is a great teacher very sweet and kind woman.I am very glad to have had the opportunity to attend TNMTC it was a great experience for me and I hope to be back at the school soon for the LPN program if it becomes available.Thank you Mr.Art,Michelle and last but not least Marie. The New Millennium Training Center taught me how to become part of a professional nursing team in a hospital with 1199 union benefits and I want to thank you Mr. Art for being my mentor. I finally did it. 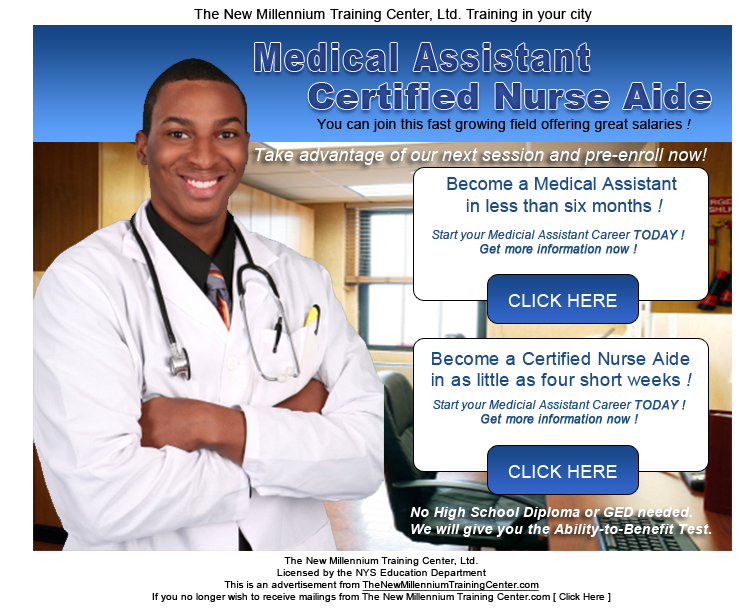 I completed the CNA and also became a Certified Medical Assistant. I made an appointment at a large practice in Manhattan, presented my credentials, was interviewed and hired and now earn more annually than friends I know who went to two & four year colleges. Thank you New Millennium ! Nurse Marie is the best! I'm really learning the things that I need to know, the instructor is doing a fantastic job.